Sylvia E. Heft’s Eighttofasttocatch was the popular winner of today’s feature on Jim McKay Maryland Million Day, defending his title in the $150,000 Classic in wire to wire fashion at Laurel Park. The Maryland Million is the one of the most important racing days at Laurel Park with 11 events for runners sired by Maryland-based stallions for combined purses totaling $1 million. The 29th annual event drew a crowd of 18,870 on a picture-perfect Saturday afternoon in central Maryland. Sent to post as the 3-5 favorite, Eighttofasttocatch carried Forest Boyce to a driving, 4-1/2 length victory in 1:50.54 for the 1-1/8 mile distance. Concealed Identity beat the rest to finish second, while Turbin was third. This was only the second start of the year for the son of Not For Love. Trainer Tim Keefe gave Eighttofasttocatch a prep in the Japan Racing Association Stakes on the opening weekend here, where he led early but tired to finish last. Today was different as he dictated the pace throughout and was only under mild pressure to win off as his rider pleased. It was the third Classic score in the last four years for ‘Catcher. The 8-year-old has now won 10 stakes races at Laurel Park and improved his career earnings to $997,970. He can become the 24th Maryland-bred to reach millionaire status in his final career start here in the Jennings Handicap on December 6. 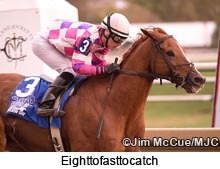 Eighttofasttocatch paid $3.20. He was the fourth son or daughter of Not For Love to win on today’s card, matching the total the Northview Stallion Station sire had in 2009 and 2011. Not For Love has 32 Maryland Million wins in the last 12 years. Eighttofasttocatch joins Hall of Famer Safely Kept (Distaff-1989-90-91), Countus In (Ladies-1989-90-91), Mz. Zill Bear (Ladies-1993-94-95), Docent (Sweepstakes-2001 & Classic-2002-03) and Ben’s Cat (Turf Sprint-2010-11-12) as the only runners to win three times on Maryland Million day. Introduced in 1986, the Maryland Million has been duplicated by more than 20 other states. Hall of Fame TV Broadcaster Jim McKay originally proposed the Maryland Million concept and remained the Chairman of the Board until his death on June 7, 2008.